You have a preposterous and daunting range of choices for apps to write in on Macs or iOS. It's great to have the choice and today's tools are superb but AppleInsider shows you how to figure out what's best for you —and what will just waste your time. When our species first looked up from the primordial soup, we probably wrote a blog about it in a word processor called WordStar. Then came fire and WordPerfect. Next came civilization and the dawn of unrecoverable documents with Microsoft Word (From $70/year). At each stage, there was one word processor everybody used and which we all used for everything. Those days are gone and we wave them goodbye very happily. For in at least the last ten years and most certainly since the App Store, our options for writing tools have ballooned. It is brilliant. Whatever you write, there is a tool that is not only right for you but which you will relish. If you spend a lot of time writing, having great tools is superb but also have a bit of relish helps. Today we have several word processors that aim to do everything but then we also have specialized ones for screenwriters. We've got text editors that suit your shopping list or your writing in the Swift programming language. We've got apps that will let you make a sleepy note on your iPhone in the dead of night and have it there waiting for you on your Mac in the morning. If you're just now looking to write on Macs or iOS, start here. If you're a decades-long old hand, start again here anyway. For until you see what's possible now, you won't imagine just how much has been done to making writing better, faster and more delightful. To make that shopping list or to jot down a phone message, you need a note-taking app and you've already got one. On your Mac, there's TextEdit (free) which is so simple and basic that you'd think you've stepped back to computers of the 1980s. However, it's so simple and basic, it so very much does not add complexity or Microsoft Word-like formatting that TextEdit is also beloved of a certain type of programmer. They're specifically the programmers who have not yet heard of BBEdit ($49.99). Only, look at that. We're barely a pixel into this and we've just gone from the most basic, free note taking app to one that is paid-for and incredibly powerful for specialized users. You're going to see this throughout the range of writing apps available as every one of them tries to add more features in order to get your custom. You're also going to see Apple coming bounding up behind them with new or improved features in its own apps. So much so that it's possible you didn't even know TextEdit was on your Mac: Apple is never going to make a presentation about it. Whereas they have made presentations about Apple Notes (free). This was a mildly handy iPhone app for writing stray thoughts down before you forgot them but now it's moved up to the next level. Apple Notes, Evernote (from free), OneNote (in Office 365 subscription from $70, Google Keep (free), Bear (from free), Keep It ($49.99) and steadily more make up this next class of app. They're still not Word replacements, they're still not for writing your novel or your medical textbook. Yet you could use them for that. You could. Don't do it, and especially don't listen to the developers who insist people have written their novels in these apps. While it's possible to do so on literally any tool, it's also a slog and we're supposed to be about making writing better and easier, not something that's possible with slogging. Take it, though, as a measure of how powerful this class of app is. You can type anything into any of them, you can do a certain amount of formatting to make the text look nice. You can't do indexing, you can't do cross-referencing, you can't write twenty chapters and easily move five of them around. What these note apps bring you that is crucial, though, is the ability to write on whichever device you happen to have nearest. Turn to your Mac to type thousands of words and every one of them is also on your iPhone and iPad. With the exception of Google Keep, which is more a visual tool and suited to a few short notes, each of these offers the same core features. They're on both platforms, they're fast, they mean you can have all of your work with you wherever you go. 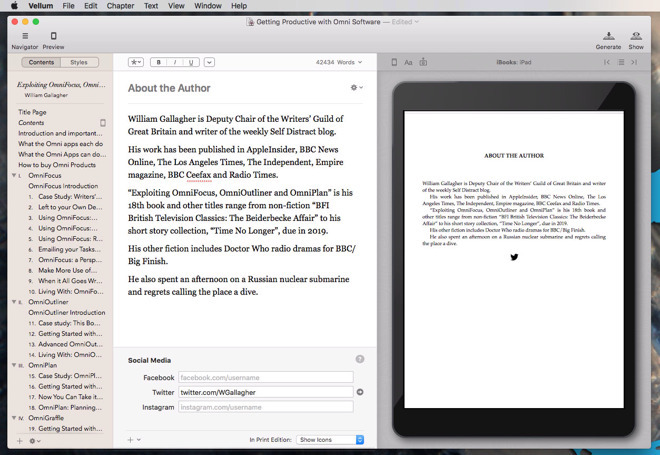 If this is the class of writing app for you, you could pick any of them and you'd be happy. However, if you use Microsoft's apps a lot for writing or anything else, go with Microsoft OneNote because it fits in particularly well. Today it's a little harder than it was to pin down the people Evernote is best for because it's broad and the competition is great. We use Evernote primarily because we have used it for years but we are moving away. That's not a criticism of Evernote, though: it's more that Apple Notes has proved handier. Even so, Apple Notes doesn't have Evernote's feature of letting you record audio into your notes. If you want to do that or if you ever need to work across Macs, iOS, Windows and Android, look at Evernote. You've come across these before. We might get frustrated at Word crashing —and repeatedly wonder why it does when stablemate Microsoft Excel is so good —but it is an astonishingly powerful tool. The odds are that most books you've read in the last thirty years were written on Word. Even now when there are alternatives, the publishing industry expects Word documents so every alternative app will save to that Microsoft format. If you're making documents with cross-references, Word not only lets you have text like "see chapter 3 for details" but if you add in another chapter, it will automatically change that 3 for a 4. It's great for footnotes and endnotes and academic features that you'd have to be in a university to appreciate. Wherever you write, you're likely to need to collaborate with people. Maybe it's just your editor, perhaps it's every single person in the entire senior management team and their comments make you want to weep. Whatever the level of pain you have to go through, Word has a comments and a track changing feature that is to die for. Apple's Pages (free with new Macs) has much of the same but not all. The problem with Pages is that it has a huge range of features and tools but Apple hides them all to give you the simplest appearance. Microsoft is like boy racer who wants his cars to have the loudest engine, the noisiest exhaust and a lot of go-faster stripes. They both, in their way, make it hard to find out what you can do with them but a rule of thumb is that Word does more. 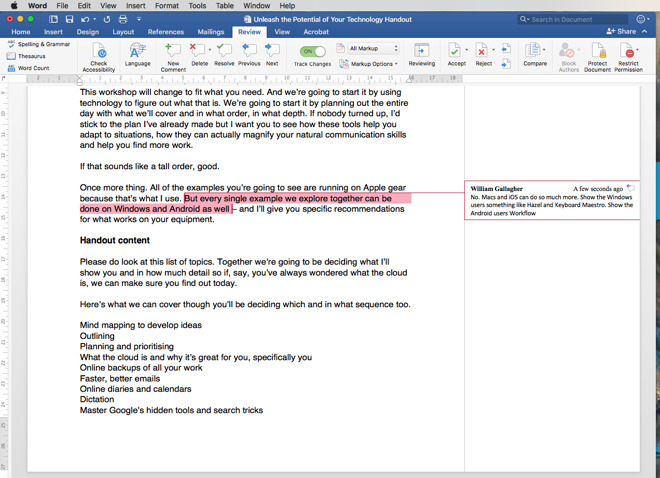 If Pages and Word are the big ones on Mac and iOS, there are others such as Mellel 4 ($49) and Nisus Writer Pro ($79). That last, in particular, has decades of development behind it and a fan club around it today. This makes it a general word processor with some specialized uses. Everybody knows that writing is writing but everybody is wrong. 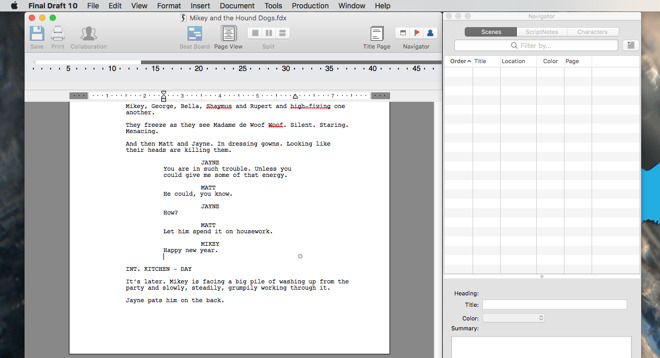 Everybody should try writing a screenplay some day. You can do it in Word but —just trust us on this, we've been there a lot —you end up creating at least half a dozen different Word Styles. Then you have to remember how to switch between them without breaking your flow and good luck with that. If screenplays, stage plays and radio drama are significant parts of your writing work, look at Final Draft 10 or Highland 2. Final Draft 10 has been effectively a standard tool for scriptwriters and, as with publishers and Word, producers expect Final Draft. Actually, these days they expect PDF so you can write in anything but Final Draft makes the scriptwriting easier. Highland 2 just makes it slightly easier still. 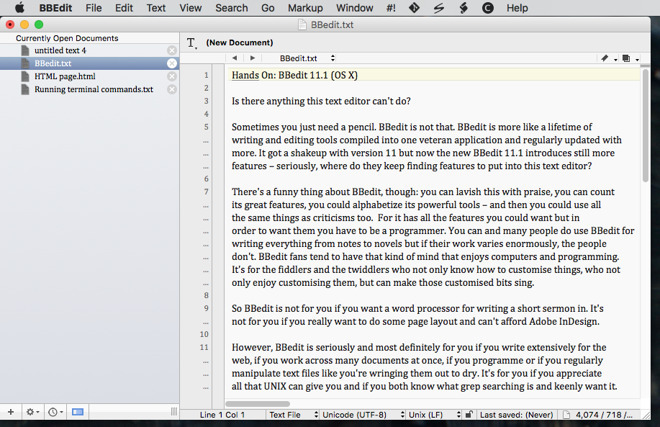 So long as you are solely writing on a Mac, Highland 2 is a modern, fast, enjoyable writing tool. It's recently added more general word processing features but it's not going to be Word or Pages. It's not the writer's job to design and produce books, or at least it never was and still doesn't have to be. What writers have always had to do, though, is cope with book-length manuscripts. That means knowing that this change in chapter 1 will cause a problem in chapter 24. Then it also means just physically handling large volumes of text and it's when you're in the 80-, 90- and 100,000 words that even the best note taking apps like Evernote will be unwieldy. Word, too, is built for this yet proves to be a pain: it can be slow to navigate a large document and even if you haven't changed anything, the Word Count is a guess for a few moments while Word catches up. Then there's the fact that Word practically boasts at you when it decides that it can recover a corrupted document. We would just like it to please stop corrupting them. It's not that every manuscript goes wrong, it's that you don't know which one will or when, so you end up saving a lot, fiddling a lot, occasionally worrying a lot. Ultimately, that's why we moved to Scrivener ($45) for long form work. Scrivener does not have Word's extensive academic tools. However, it feels lighter when you're writing in it and it flies when you're editing. There's a Corkboard view that helps you organize even large chapters. It's got the ability to let you focus on just, say, chapters 7 and 11 together and exclude the rest. More, where you feel Word was written by engineers —talented engineers but not writers —Scrivener was made by one of us. You can see that in a dozen small touches that make your writing flow but you can also see it in the app's research feature. Scrivener's developers know what it's like to write large projects. 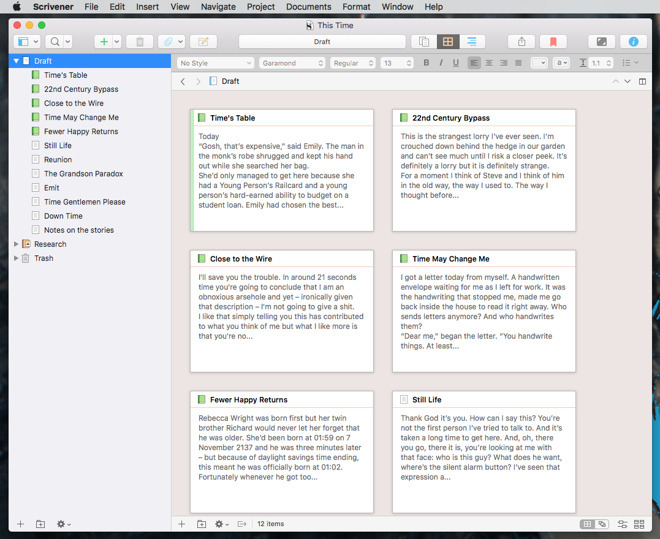 Whether it's fiction where you might want to make character notes or it's non-fiction where you have to compile a lot of research, every Scrivener document comes with a research folder. So you open your book and there's the text that will be ultimately be read by your audience but right there in the same document is anything else you need. Rough drafts, discarded chapters, PDFs of research documents, web links, inspiring images. Anything. Everything. When it comes to the producing the book, you can get Scrivener to compile all of your chapters into a nice, neat Word document that you send to your publisher. Equally, though, you can take that Word document into Adobe InDesign and produce the hardback book yourself. Somewhat easier than mastering InDesign, the tool of international publishers, is Vellum (From $199). That's a tool for making e-books and paper- or hardback ones too. Both it and Scrivener have recently been updated to work better with each other and effectively turn your Mac into a publishing house. You could write your book in Vellum: its text-editing features are good. Yet even the makers say you shouldn't. 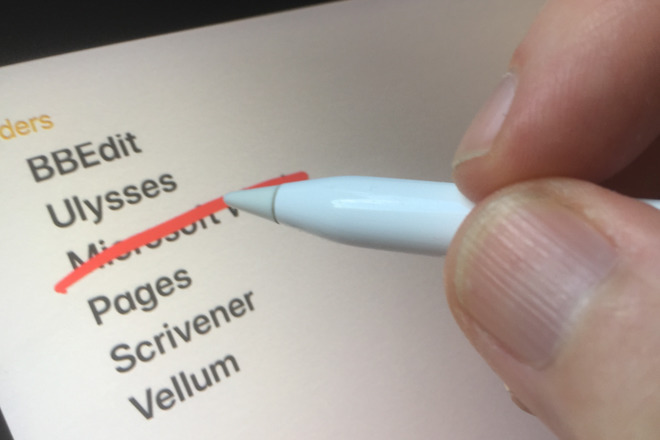 Use a tool like Scrivener or Word which provide features to help the person actually doing the physical writing. You're not going to write your shopping list in Vellum, not unless you're really serious about publishing every detail of your life for the world to enjoy. For that matter, you're not going to use Scrivener for your shopping list or phone messages either. Instead, if you're writing a lot, look at getting more than one app from across the spectrum of tools. A note-taking one is a boon for anyone. Then there are also two apps that refuse to fit neatly in this array of writing tools but which we would be negligent if we didn't mention. The first is Drafts 5 on iOS. It appears to be the most basic of note-taking apps but that apparent simplicity belies how much power there is under the hood. You can jot down that phone message in Drafts 5 and then tell it to send an email or a message or an SMS to someone with that information. We just wish it also ran on Macs. The second and last of these tools does work on Mac and iOS: OmniOutliner. We use this even more for planning events than we do for writing but it is so good at helping us sort out any ideas that we've used it hundreds of times this year alone. This is one of those apps where the developers say people have written novels in it and we don't doubt them, we just don't understand why. For while there is a part of us that misses how simple it was when you wrote everything in the same app, the features and facilities of this range now is just too gorgeously great. 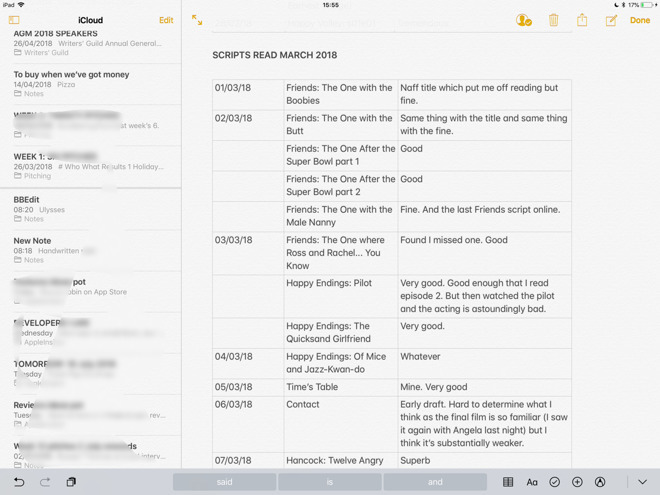 Today we have the easy ability to jot a thought down on an iPhone notes app, develop it in Drafts, then turn it into a novel in Scrivener and a screenplay in Final Draft. This is a very good time to be a writer. At least it is once you can sort through the sea of different apps available —and this isn't even all of them.